Deadline to receive CE credit in 2019 is December 31. If you complete your course after midnight, you will not receive credit for 2018 and will be assessed a $500 fine from KREC. There are no exceptions. All licensees in active status are required to attend six (6) hours of continuing education courses, with three (3) hours being in real estate law. The courses must be sponsored or approved by the Kentucky Real Estate Commission (KREC). A licensee shall complete the mandatory continuing education requirement by December 31st of each calendar year. Additionally, Kentucky requires a state specific continuing education course (the Kentucky Core Course) to be completed by all active licensees subject to continuing education once every four years. Visit the KREC website for more information or check your education status through the Kentucky Real Estate Commission Database. As of January 1, 2016, an individual obtaining their first, original Kentucky license is exempt for the first two (2) calendar years only, regardless of whether the license is issued in February or November. PLE is required during those two years. Per Kentucky law, students are not allowed to complete more than 9 hours of Pre-Licensing and Post-Licensing coursework per day. It's the students responsibility to track their hours. Please contact KRI with any questions. As of January 1, 2017, the Code of Ethics training requirements are now two year cycles. A new two-year cycle began January 1, 2019. The deadline for this cycle is December 31, 2020. If attending a live classroom course does not fit your schedule, Kentucky REALTOR® Institute offers online education options as an alternative. These courses are available to give you the ability to take courses on your schedule at your own pace, anytime and anywhere. You have no need to hop in your car and take time (and money) out of your schedule to complete a course. Education has never been this convenient! Please keep in mind, you must complete and successfully pass a final exam for any online course you take. This is a requirement for every course for every provider. If you do not pass the final exam, you will not receive credit for the course. Please check your license number to make sure it is correct. The number you provide is the number that will be reported to KREC. 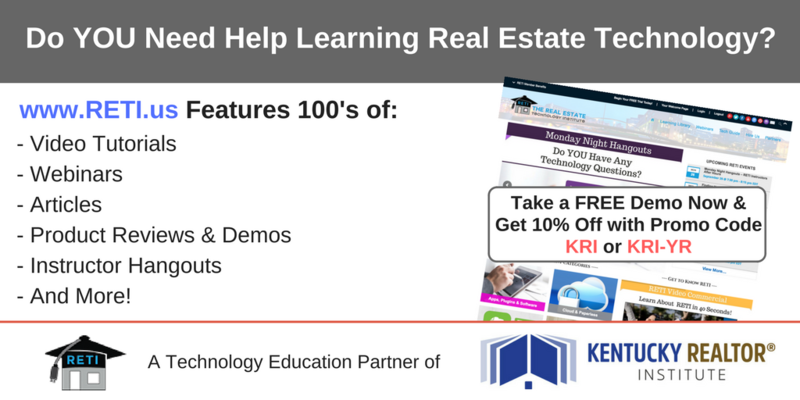 Kentucky REALTOR® Institute has 10 business days from the date of class to report education credits to KREC. Please provide KREC a few weeks to upload that information into their system.You can look up your education credits and license status online through the Kentucky Real Estate Commission Database. These new courses are video based making them more engaging and offering the feel of having the instructor live and in-person. The ability to understand and recognize different negotiating styles and strategies results in successful client interactions and closed transactions. This course introduces students to "DISC Behavior Profiling," training students how to build trust and connect with others, balance emotion and logic, reduce stress, and ultimately achieve a "Win-Win-Win" negotiation. You'll laugh and learn as your instructor, Tom Lundstedt, CCIM, enthusiastically leads you through real world, rental property examples. When you've completed this course, you'll be able to comfortably "talk the talk" with your investor clients about such items as: cash flow, NOI, depreciation, rate of return, income tax savings and much more. This course will increase your confidence when working with investor clients and open your eyes to many new opportunities. This course is designed to help real estate professionals better serve their clients and increase their confidence when asked questions regarding the construction of the homes they market. The student will learn about the structure of houses, both new and existing, and focus on how floors, walls, and roofs are built. This course will empower real estate professionals to give accurate generic construction information to their clients without taking on personal liability while recognizing when to defer to the assistance of qualified experts. This course covers discrimination and housing, types of violations, advertising rules, ADA, penalties, fair employment practices, fair credit practices. It also explores antitrust laws, bankruptcy protection, environmental considerations, and data security. In a time of financial restructuring and a rapidly developing regulatory environment, this course offers an invaluable resource for real estate professionals practicing in several different fields. From the restructuring of government organizations like Fannie Mae, Freddie Mac, and the new Consumer Financial Protection Bureau to updated private policies regulating loan limits and flood insurance, the course takes the pulse of the current financial environment and explains it with clear language and advanced educational concepts. Sustainable Housing and Building Green: What Agents Should Know takes the mystery out of green and sustainable building concepts for commercial and residential real estate licensees. The text differentiates between government initiatives and nonprofit, private associations and explains how each impacts green building and maintenance practices. Licensees looking to serve the expanding market of consumers interested in high performance building practices will find practical information on products, designations, and certifications such as LEED and Green Globes. This user-friendly interactive course borrows from topics covered in Introduction to Commercial Real Estate Sales and Property Management and Managing Risk. Specific topics explored include the nature of commercial real estate, classifications of real property, lease types, market value, and rate of return analysis. To view all the courses available online, including additional NAR certification, designation and professional development courses, click here. Every licensee should check the KREC Database to see what courses have been completed and whether the Core Course is required that year.